El Cuartito – Buenos Aires, Argentina | rubybeanx. Pizza isn’t hard to find in Buenos Aires thanks to the huge Italian immigrant community living here. Think Lygon Street mixed with Jersey Shore on crack. And damn these Argentine Italians make good pizza. We hit El Cuartito, a staple in any tourist’s or Congreso inhabitant’s diet. Celebrating its 75th year in operation, El Cuartito has wall to wall covered with soccer memorabilia. It reminds me a little bit of Rocky’s La Porchetta in Carlton, but way cooler and just as cheesy (pun half intended). Walking in at the tourist’s dinner time of 7pm instead of Argentinian dining time of 8pm and onwards, the diner was full of tourists and old guys. The waiters were all old men who looked like they’d worked there for the entire 75 years of the pizzeria’s existence. Service was concise, friendly and efficient – the pizza was spectacular. Delicious thick based thick crust pizza, covered in its entirety with luxurious ‘muzzarella’ cheese. It makes so much sense to me, I don’t get the point of leaving the crust uncheesed on an eat-in pizza. We asked for The Atomic, and while Argentines are notorious for not adding chilli to their foods, our pizza had a thick layer of what looked like chimichurri but minus the oil and plus a tonne of chilli flakes. 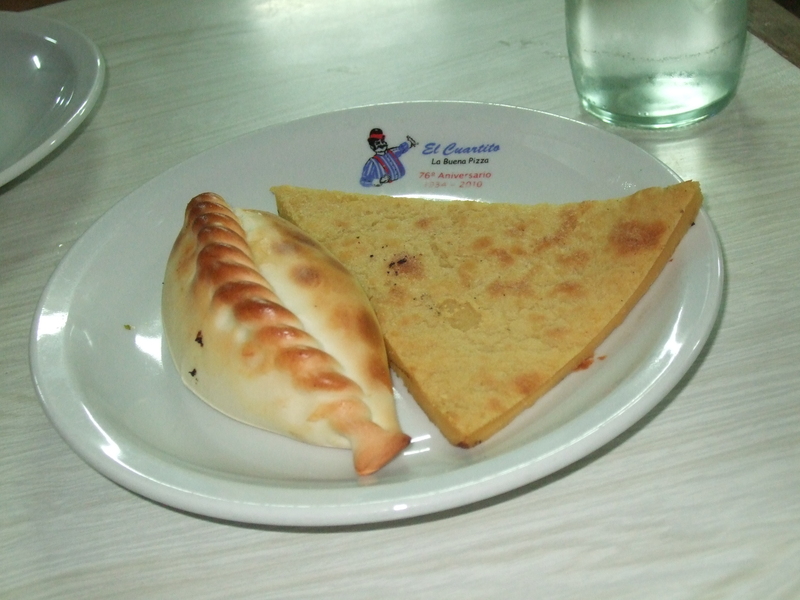 We also had a delicious empanada frita and a slice of faina – an Argentine style pizza made from chickpeas and flour. The faina was brilliant yellow and weirdly addictive, it made for a yummy appetizer. Old Italian guys living in Buenos Aires sure know how to impress a girl with a hungry appetite, and they provide an excellent break from the meat eating scavenge of the city. OK to bring a date? no, much better for casual eats. Tags: Buenos Aires, cheap eats, pizza. Bookmark the permalink. 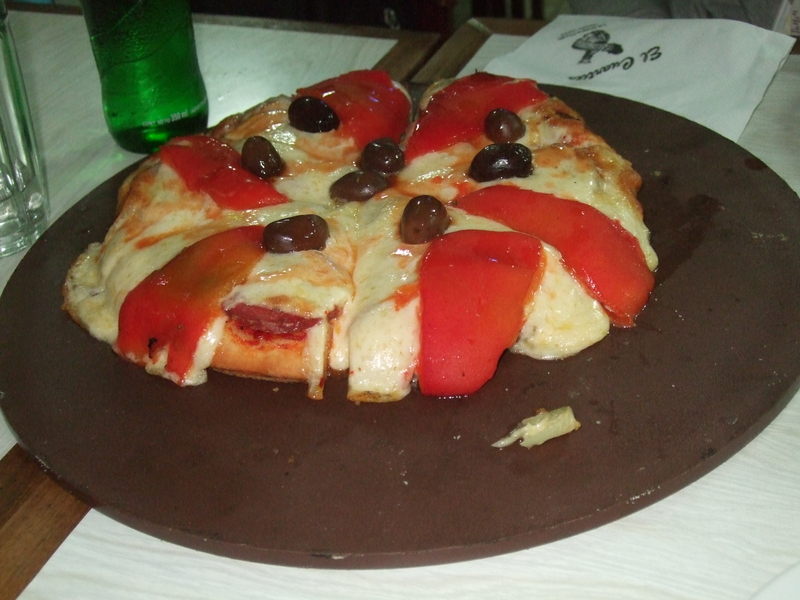 Mmm, I love the pizza al Quartito!